TV Guide crossword puzzles were always my mother's favorite Sunday evening pastime. It's not that she couldn't handle the New York Times' notoriously challenging crossword, it's just that The Evening Capital newspaper didn't have a Sunday edition so we didn't get the puzzle. My father worked as the classified advertising manager at The Evening Capital so we received a free subscription tot he paper. 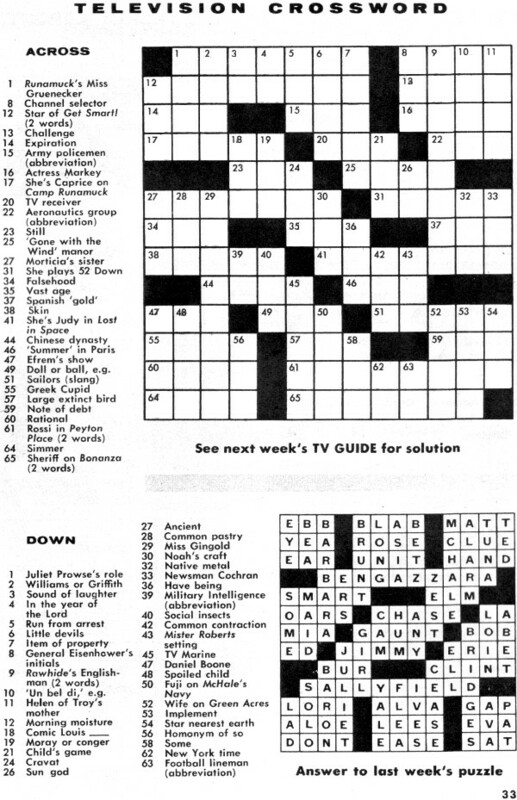 This particular crossword puzzle appeared in the edition of TV Guide that featured the first-ever airing of "A Charlie Brown Christmas" which I bought on eBay, so I figured I might as well scan and post it. Enjoy! Back in the day I was not an avid crossword puzzler, but I am now a daily worker of crossword puzzles and once a week I even create a custom crossword for visitors of my RF Cafe engineering website.